Correct feeding and balanced equine nutrition is essential for the growth and correct development of foals and young horses. The most natural feed for a foal is its mother's milk and normally this will provide the calories and protein needed for foal growth. However the level of minerals important to equine skeletal development rapidly decrease during lactation. By the 5th week some of the trace minerals in the mare's milk may have lowered by 50% and may not adequately meet a foal's nutritional needs and the general advice is to give a foal additional feed. Foals should not be allowed access to their mother's stud ration; instead you should give an equine creep feed from 10 days old, together with the milk the foal suckles from his mother. 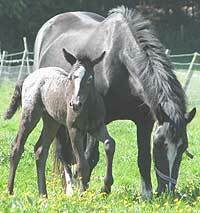 A foal should be given 0.5g of equine creep feed per day for every month of its age, e.g. a two month old foal should receive 1 kilo of feed. However this should be restricted to a maximum of 0.5 kilos - 0.75 kilos per 100 kg of bodyweight. Foals have small stomachs - split the daily ration into 2 to 3 feeds. You should be very careful not to overfeed a foal since this can cause abnormal growth and be detrimental to its health and may even cause Developmental Orthopedic Disease - although in many cases this is hereditary. It is commonly believed that the most dangerous type of diet for a foal is one that is low in minerals and high in energy. This promotes rapid growth - but lacks the mineral building blocks to support it and may result in abnormalities when the foal matures into an adult horse or pony. Feeding cereals such as oats and barley on their own without supplements are an example of such a bad diet for a young horse as they provide plenty of energy but have a low mineral and vitamin content. Make sure that the foal can eat his own feed by using a creep feeder - this will prevent the mare from eating her foal's feed. As with an adult horse a foal should always have free access to a supply of fresh, clean water. A foal doubles its birth weight within 5 weeks. At 6 months old weanlings have only reached 45 - 50% of their expected height as a mature horse. Weight at birth is approximately 10% of adult weight. Foals usually obtain 60% of their mature horse weight, 90% of their mature height, and 95% of bone growth by the time they are yearlings. 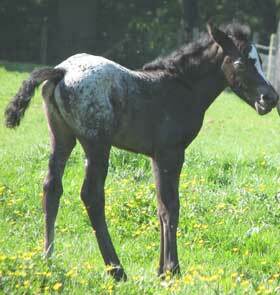 Growth rates of Thoroughbred foals during the ages of 6 - 12 months will average between 500 grams to 1 kilo a day.